What is Wag? - Wag Pet Gear! My name is Macy and I’d like to introduce Wag Pet Gear. Wag makes custom ordered harnesses and other accessories such as leashes for all sizes of dogs, cats and other small pets like rabbits. 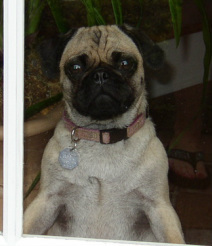 I’m a very bodacious pug so I always had a hard time finding harnesses that fit my curvy figure and appealed to my discerning sense of style. My mom started making harnesses for me and my brother and sisters. So many other dog parents asked for harnesses for their special pets that Wag was born. Our goal is to provide functional, easy to use, yet very cute harnesses to fit all sizes, breeds and personalities. If you don’t see something that appeals to you on our website send us a message and we will try to accommodate your fashion sense. Who makes all the creative decisions at Wag? This is my mom, Jen, with my brother and sister, Milton and Mackenzie. 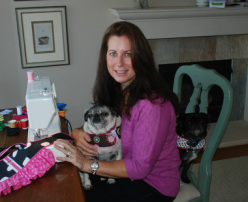 She is the creative genius behind Wag Pet Gear. She keeps us looking stylish! It's a Waggy, Waggy, World!